– Enhanced livability over current low income housing: traditional design for cultural acceptance; warmer (huge psychological boost when the floor and air temperature are always comfortable); more pleasant living environment with abundance of plants and much greater daylighting (combats cabin fever); fresh food production and higher oxygen level; superinsulated design with far lower energy costs (money stays in the community); adequate space for extended families and storage; greater self sufficiency. Thick, high mass walls and floor will absorb the heat, and a thick layer of insulation around all sides (including under the floor and on the roof) will trap the heat inside. You could even grow bananas or other tropical fruit with this sort of design. This Plan is offered for free. Either copy the images above, or go here for detailed PDF plans. Hello! Do you have CAD available for Solar Pit or Spiral House? Email me for details. My address is at the top of the page under About Us. Hey Laurie, I am looking to get a copy of the CAD for Solar Pit too, however I read that Owen passed on in November. Could you send me a copy if you managed to get one? Jonathon, I can send you CAD copies for that plan for $100. If you go to http://dreamgreenhomes.com/store/store.htm and indicate the price and the name of the plan. Nice article, Before adding solar features to new home design or existing house, energy efficiency is the most cost-effective strategy for reducing heating and cooling bills. I love this design. I’ve been wanting something similar to an earth ship, but always had concerns about the use of tires. This seems like an ideal alternative, since it seems to share many of the design benefits. I’m looking to build in Canada, and I’d be interested in the CAD file if you have it. My email is at the top of the page under About Us. I really love your solar pit house plans. Do have any 3D cad or sketchup plans for this house? I would be very interested in them if you do. Hoping to start construction this fall. Would be willing to by the detailed plans if you have them. Thanks for your help! Yes, they are available. I will email you. Firstly thankyou so much for all of this hard work and the sharing of it, an incredible resource. I am writing as myself and my partner are planning building something along the lines of this structure in the Highlands of Scotland, we may have to substitute tyres or strawbales for the earth bags as i dont think there are any earth bag houses in the uk yet. Just wondering if you think this would be a suitable design for the climate, our site is on the east coast, slightly less damp than the west coast.The site is on a south facing slope. That could work. Talk to people who have built with tires and straw bales in colder/wetter climates first. Ok thank you so much! Is there a better design you would recommend for high dessert? Choice of house design is primarily personal preference. All are energy efficient, etc. Start with something small like a tool shed. Then if it suits you move up to something like the Economizer (see Free Plans). This would be a very low cost, low risk approach. You could add on later, build a bigger ‘dream’ house later… whatever you want. Hi Owen Geiger! You are amazing!! Thanks so much for all your hard work and beautiful information. I am thinking of building this Solar pit house on pretty Flat land in Reno, NV. It is dry desert with cold winters and hot summers. I really like the earthship style greenhouse in the front, but love your spin with earthbags and design. Can you direct me if this will be the right design for the high desert climate? It can work with shading in the summer. Remember it’s primarily designed for really cold climates and collecting and utilizing sunlight as much as possible. Too much sun = overheating. i’d love to have something like this, or some kind of design that takes advantage of tubular skylights to use natural light inside the home as much as possible. the back parts of earthships tend to be kinda dark.. anyway.. i love this design.. i love that you can put a root cellar in it, too. you’re really creative! First of all, you want to build highly vented living spaces in the tropics that are raised above the surrounding area to reduce moisture problems. Earthships are just the opposite of this = not a good idea. Then search this blog for two articles called Passive Cooling Strategies that list dozens of simple, low tech ways to cool and ventilate your home. Choose 10 or so ideas from this list. The tubular skylights, which work great, have been covered on this blog, as have earthship type designs made with earthbags and bales. Thank you. Don’t forget a water tank to collect roofwater. We’re currently building one now that I’ll publish on our blog soon. Estimated cost: $200 – $250 for 6′ diameter x 6′ high water tank. Plastic tanks this size cost around $4,000 from what I’ve been told. You can make your own in two days with four workers. No, this is for cold northern climates like Canada where you’re trying to bring as much sunlight into the house as possible. It would overheat terribly in your area. You want just the opposite design — wide roof overhangs, lots of ventilation, etc. Search this blog for Passive Cooling Strategies. I am new to this and would like to know if this home would do well in South Carolina. The winters here are usually very mild but our summers can get quite hot. Can the home also retain cool temperatures as well as it does the heat? Hello, we live in Montana and we’re building a house. We plan on going with this design, but we’re not sure how it would work with the location. We live in a valley, and plan on digging into one side, building the house there, and using the earth to cover up the roof and three sides (obviously the front/greenhouse would stick out to catch the sun). We were hoping you’d have some advice on water prevention since it will be coming down on three sides, and just overall any advice you might be able to offer for this situation. Thanks! The Solar Pit House should work great in Montana. Risk of water damage is your main concern. Study this subject carefully because I don’t have time to explain it all in detail. Use various techniques to drain water away from the building, including a French drain in a rubble trench, layers of strong plastic sheeting as ‘wings’, heavy rubber bituthene against the building, rot and water resistant wall materials such as 24″ wide scoria bags that provides excellent insulation, and include one or two swales above the house to divert water the bulk of the water. Also, be sure the hillside is not too steep or the runoff could overwhelm everything and cause problems. how would I go about building this in my area that has codes. Realize that the cost could increase 10x. It would cost around the same as most houses in your area. Contact Structure1.com if still interested. They can get earthbag houses permitted almost anywhere. 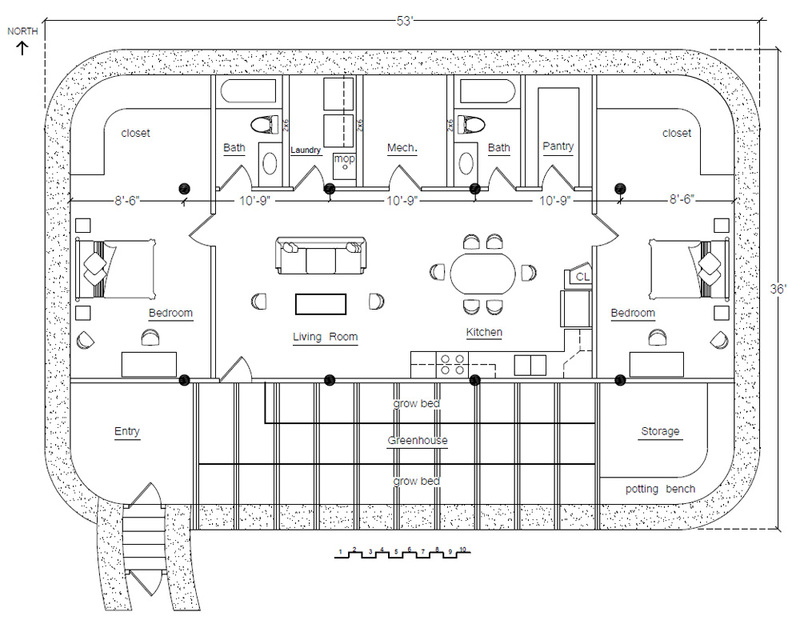 I have a great affinity for the Solar Pit house plan. 1)I would put the kitchen on the north side and have a root cellar for refrigeration. 2)I am wondering if you can modify the plans to make the shell papercrete over an armature of hog wire and chicken wire? 30 At what angle should the glass in the south side be installed to best get the winter sun in The Pacific Northwest? Thank you for your pioneering enthusiasm! Papercrete would be susceptible to moisture damage. A ferrocement shell with lots of insulation would work better. There are free programs and websites that explain how to calculate the solar angle. Adjust it to your specific area. Building a project such as this successfully in Alaska will be very dependent upon exactly where in Alaska you intend to build. There is a stark contrast in climate between the southern costal areas, and the permafrost covered northern interior that receives only a pittance of sunlight in the winter. It would be EXTREMELY useful to calculate the heating load and solar gain of such a house for the particular climate at the precise location you intend to build. Here is an extremely powerful FREE software program which can do all the hard work for you. I cannot recommend this type of tool strongly enough. Hi, me and my wife are looking into building a house on some property we own in Alaska. I fell in love with this design but was wondering if you thought it could hold up to the harsh winters? Yes, that’s what it’s designed for. You might want to add some covers over the windows, etc. Modify it to meet your needs. Greetings from Carolina! I’m bored at work so I decided to browse your site on my iphone during lunch break. I love the knowledge you provide here and can’t wait to take a look when I get home. Thank you for sharing your wonderful designs. I live in Oklahoma and would like to build a home that would be safer from tornadoes than a traditional wood framed home. Would a pit home be the best design? I want to build in the country and be as self-sufficient and off-grid as possible. I hope to build with recycled materials and end up with a comfortable and super low cost earth friendly home. A pit home could work if you use vertical glazing and appropriately sized roof overhang to prevent overheating. You could build roundhouses with earth berming. You could build roofed domes with berming. (There are thousands of houses like this. These are just a few examples.) Make sure to include plenty of cross ventilation! Very nice website- I’m quite excited. If you’ve built this house in an area that requires building plan approval – how have you accomodiated for bedroom fire egress? You’re doing Great work . It’s designed for maximum energy efficiency in cold non-code areas — particularly areas in the far north. You’d have to modify it for code areas as you point out. These are some great house plans. I wish I had the land to be able to build something like this. Some of these plans can be built for a few thousand dollars ($2,000 -$10,000). The low cost equates to low risk, which means you could negotiate a deal with someone who owns land and work out some sort of trade. For instance, you get to live rent free for X number of years in the house if you buy the materials and build it. I read of one guy who does this every 10 years or so and never pays rent. See the blog post on building ‘straw bale roundhouses in one day’ for just one possibility. I am writing to request detail plans for the Solar Pit House. What a great design! So glad I found your websites, tons of information, thank you. Even more of a blessing for us that you offer then for all to use. They’re not super detailed. They’re general plans that you can adapt for your situation. Please document your project and share with others. Ok, thanks. Would you go with a bermed or above ground structure in this area? Definitely above ground, but you can add 24″ or so earth around the perimeter to help direct water away from the building. This is the real definition of a berm. For sure don’t go below grade in rainy areas. I like the idea of having the greenhouse incorporated in the living space. I do have a couple of concerns however. In warmer and humid climates how do you prevent the greenhouse from getting too hot also making the living space too warm. The other concern is with the water needed to keep the plants healthy is there a way to prevent mold from becoming a problem. I live in the central/southeast Texas area and am considering Earthbag construction, would this be a good choice for this environment? 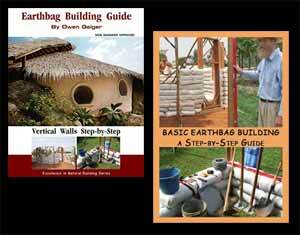 Any recommendations on style of Earthbag homes will be greatly appreciated. The greenhouse in this design is separate from the living space. That’s the best arrangement because plants and animals have different needs. In your area, for instance, a connected greenhouse would make the living space too hot and humid. Choose a design based on your needs and likes. Roundhouses are easy to build. Thank you so much for sharing your plans and ideas. I am hoping to share this kind of information when I start my business…helping people make choose more sustainable ways of life including food growoing, naturatl pest control, companion planting (etc), composting, building/living, building rocket stoves for heat, water reserving/safety, a bunch of things. I hope to add your houses and your website too. That way if anyone can build a house like this, they will have your information to access your professional plans and help. Thank you for your sharing and wonderful ideas. Thanks. It’s interesting to learn how all these things go together. We BRIO team looking for Eco friendly house plans for our agro tourism site at east of Sri Lanka. We would be greatfull if you can help us by sharing ideas , plans & other resources what you can share with us. we suppose to do grate job in eastern Sri Lanka after end of conflict to enhance the living standarded of innocent people there. Kindly come up with your valuable contribution !! I’m moving this to our Bulletin Board where people will see it better. My email address is at the top of the page under About Us. What house plans are you interested in?